Have you heard about the new MDS2? Check out the fun you can have! My sons are huge fans of Pokémon. Pretty much whatever he can get his little hands on. 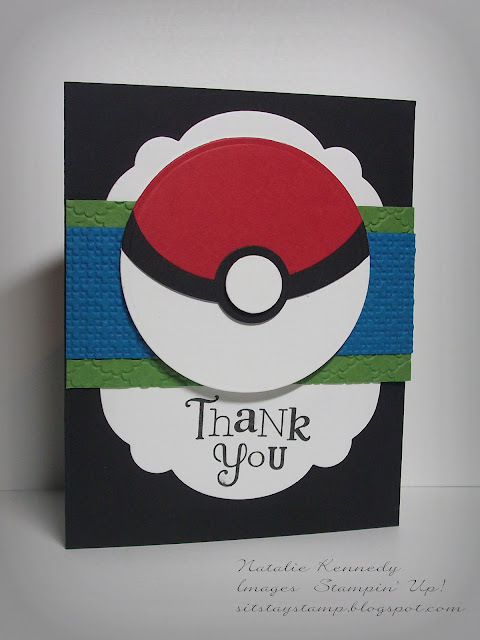 So when a friend of ours brought him back some real Japanese Pokémon cards from his trip over there, I figured a special thank you card was in order and I wanted to incorporate both sons' favorite colors: blue and green. This, (in case you don't speak Pokénese, not that I really do either) is a Poké Ball. In the game, it's a contraption for catching and transporting Pokémon to battles by their trainers. But my little guy was thrilled with this card I made and couldn't stop pressing the round, white button I popped up on a dimensional. Anyone else out there with kids still obsessed with Pokémon? I'd really think this fad would have died down by now!